Hello, dear friend. Let me introduce myself. My name is Martha. I have a sister named Mary and a brother named Lazarus. We are good friends of Jesus of Nazareth and His disciples. I’m sure you know us well. Yes, my brother was the one whom Jesus raised from the dead. It was amazing. Words just cannot describe that scene. Shortly after Lazarus came back to life, my sister Mary anointed Jesus’ feet with expensive perfume as an expression of deep gratitude. And what is recorded about me? You know the story well. Look it up in Luke 10:38-42. Yep. That’s me, complaining about my sister not helping me enough. What a legacy. Of my whole life, that one incident is the thing most people remember about me, and I’ve gotta say, I really get the short end of the stick. I mean, come on. My sister was just sitting there- sitting down while there were more than a dozen men in our house. Do you realize that the custom of our day dictated hospitality? We would have been rude not to serve them a meal, and we were happy to do so, but there was no take out or frozen pizza back then. Everything was from scratch, and Mary had left me to do this meal all by myself! Do you realize how infuriating this was? Has anything like that ever happened to you? I’m sure it has. Haven’t you ever said, “I’m the only one in this household who ever cleans!” or “I am sick and tired of feeling like the maid here!” or “Is it too much to ask that my husband helps with dishes just once?” If you’ve ever said or thought such thoughts, then you know exactly how I felt that day. People have said that I whined to Jesus about Mary. I’ve even heard the word “tattle” used. Was it childish? Okay, sure. I’ll give you that. But you have an advantage over me on that one. Your childish comments aren’t recorded in the Bible for everyone to read and dissect. It’s very easy to read that one account and assume that I was uptight and missed the entire meaning of Jesus’ coming to earth. That is not true. Far fewer people realize that I was the one who, when Jesus came to town after Lazarus had been dead four days, had a conversation with Jesus that included some of the most well-known and comforting passages used at many funerals still today. I believed in Jesus, make no mistake about it. I told Him that if He had been there, Lazarus would not have died. I knew He had the power over sickness and death. Then Jesus told me that Lazarus would rise again, and what did I say? “I know that he will rise again in the resurrection on the last day” (John 11:24, ESV). You see, I hadn’t missed all of Jesus’ teachings. I wasn’t rushing around ignoring Him every time He came to our house. I knew about eternal life. I knew about the resurrection of the saints. I knew that someday in heaven I would indeed see Lazarus again. Then Jesus said words that have comforted Christians ever since- “‘I am the resurrection and the life. Whoever believes in me, though he die, yet shall he live, and everyone who lives and believes in me shall never die'” (John 11:25-26, ESV). Wow! But Jesus wasn’t content to leave it at that. He then asked me pointedly if I believed that statement. My words then have been repeated ever since and are among the great confessions of the Bible. “‘Yes, Lord, I believe that you are the Christ, the Son of God, who is coming into the world'” (John 11:27, ESV). That was no generic confession, my friends. That wasn’t me saying, “Yeah, I believe in God, sure.” No, this was specific. Jesus is the Christ, the “Lord’s anointed.” This Jesus of Nazareth is no mere man, He is the Son of God, who is coming into the world. Do you realize what that means, dearest? The Son of God actually entered this world as a human being! I knew Him personally and I still can’t comprehend that incredible truth! Why would God do such a thing? The answer to that question actually comes further on in this whole Lazarus episode. The only time the Bible records Jesus crying is during this event. He saw how much we loved Lazarus and how brokenhearted we were at his death, and He saw the tomb of His dear friend, and He cried. That, dear one, is why Jesus came into this world to save us: love. God wasn’t content to allow His wayward children to stumble along in their own sins, headed straight down the road to hell. No, He loved us and came after us. He loved us enough to send Jesus to take our punishment for us, and when Jesus suffered and died on that cruel Roman cross, when He rose victorious from the cold stone tomb three days later, He showed us how far He was willing to go to win us back. He loved Mary, He loved Lazarus, He loved me, and He loves you. So what does this mean for you today? The world has changed a lot since Jesus came into our home some 2,000 years ago. In many ways your lives today are easier than life in biblical times. You have ovens and stoves and indoor lights and running water (with water heaters) and washing machines and microwaves and cars and so many inventions that make daily tasks easier. Yet you also have it more difficult than we did back then. Along with these inventions that make life easier, your schedules have become far more complicated than ours were. We pretty much had the same schedule week to week. We had different chores for different days but daily chores took so much time that there wasn’t room for other things. We rose early in the morning to bake bread rather than running to the store for a few loaves. We washed our clothes by hand instead of throwing them into the washing machine as we ran out the door. In our day, it was expected that we more or less stayed home and worked on the tasks required for daily living. Now you have work schedules and sports schedules and lessons and recitals and working out at the gym and carpools and volunteering and meetings and duties at church and more. It makes my head spin. I can’t even comprehend that way of life. Your world is so fast-paced. Technology is advancing every day, and that’s a can of worms in and of itself. So much of your lives now revolve around computers and iPhones and gaming systems and TV that I don’t even know how you do it all. I’m sure many of you wonder the same thing. How do I fit everything into my life? Learn from me. 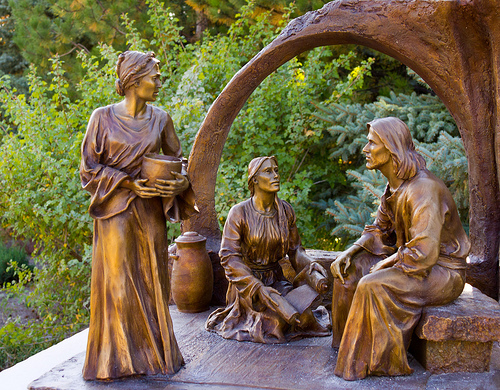 What was Jesus’ response to my complaints about Mary? He said, “‘Martha, Martha, you are anxious and troubled about many things, but one thing is necessary. Mary has chosen the good portion, which will not be taken away from her'” (Luke 10:41-42, ESV). There is a hymn based on this event, too, in the Lutheran Service Book, number 536, called One Thing’s Needful. Please allow me to quote for you the first verse. One thing’s needful; Lord, this treasure teach me highly to regard. All else, though it first gives pleasure, is a yoke that presses hard. I count all but loss that I Christ may obtain! Friends, if you are too busy for devotions, Bible study, prayer, and worship, then you are too busy. Evaluate the activities in which you participate. Are there any you can cut out? I’m not suggesting the life of a hermit, but don’t feel the need to do everything people ask you to do. Learn to say no. Cut out any activities or obligations that you do only out of guilt. Do a “time audit” of a typical day or week in your life. I’ll bet you’d be surprised to see just how much time you waste. No offense, but it’s true. How often do you get on Facebook for a quick peek only to realize an hour later that you’re still on? How much TV do you watch on a typical night? How often do you neglect to plan ahead and consequently find yourself running to the grocery store almost every day? How often do you start one task, get distracted, and move on to other things only to realize at the end of the day that you never really finished any of the things you started? Everyone does these things, so don’t feel guilty. Use this as an opportunity instead. Put your phone in another room and read a Bible story to your kids. Turn off the TV at night and pray and read the Bible yourself. Set aside half an hour once a week to plan out a grocery list so you don’t have to run out every day. Focus on the task at hand until it’s finished so you don’t have a bunch of half-started tasks left undone at the end of the day. Be deliberate about these things. Remember, the one thing, the only thing needed in the end is your relationship with Jesus. Yes, we do have worldly duties. You have to buy groceries, you have to make meals every day, you have to do the dishes and laundry, you have to clean your house on occasion. These things must be factored into your daily life, but they cannot be allowed to take over. Set aside a certain time each day for your own devotional and prayer time. Try getting up 15 minutes early so it’s the first thing you do each day. Or do it in the evening before you go to bed. What better way to end your day than in prayer and reading the Bible? Or do it while your kids are napping or in school. Get recharged in the middle of the day when you need the encouragement. The point is, make yourself accountable. Schedule it into your day. Because remember, daily tasks will eventually cease, but your relationship with Jesus will last for all eternity.